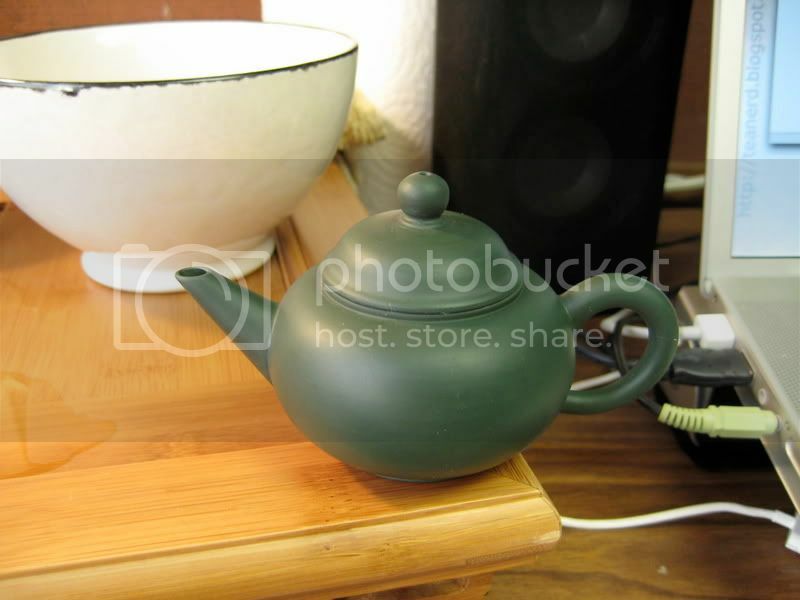 Hey- is that one of the zisha pots with the internal ball shaped filter sold by chinese teapot gallery on Ebay? If so, I have one of the same clay, but in the dinosaur egg shape. Mine seasoned up beautifully with regular use. The surface started out rather chalky looking at the start- even after a few days soaking in strong shengpu it was dissapointing looking. However, afer several months of regular use, it has soaked up the tea oils like a sponge and is now a really deep, rich forest green color. Give it a good chance to season- if it is like mine it is really worth the wait. It just gets better and better. Would you like me to try to get a picture of mine? Quite the pretty pot. I hope the seasoning goes well! | Mmm...Grandpa method. Muy easy. Muy delicious. | Woot tea! Can't wait to read about them! Brent, are you using brand new fresh tea leaves on this pot? I have been using spent leaves. Eanglin, Yes, yes let's see your pot!! Do I understand you to be saying that you started out soaking the pot but stopped soaking and still got your satisfying result? 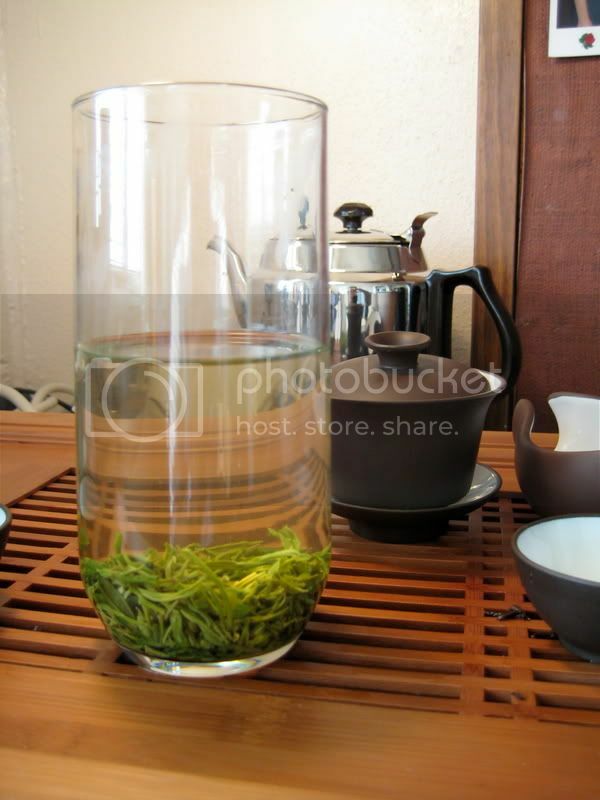 Does regular use involve any tea touching the outside of the pot? What causes the transformation? Ah yes, I forgot it was called the grandpa method. I wonder... what would be the grandma method? Don't worry, I'm using spent leaves. By fresh I just meant from a recent session, instead of pouring hot water over the same leaves that had already been soaking. Man, I didn't realize until I got her outside how badly she needs scrubbing- I'll have to buy a new scotchbrite pad to polish off some of the excess staining. (I usually just rinse her out, but, I'll admit, clean up often gets left until the next morning due to distractions from my son. This pot is around a year old, maybe, and I use it once or twice a week. Those photos are quite pretty and the pot looks like a real beauty that has benefited from plenty of TLC. Based on the photo, I personally would lean toward leaving the stains there. IMHO, they give the pot character. I certainly wouldn't think of attacking the poor darling with a scotch brite pad. Where did you purchase the pot? I would have to agree that the color argues for both your lovely green pots coming from the same clay deposit somewhere in China. The photos themselves, BTW, are quite fetching on their own. There's nothing like a teapot photographed in its native habitat! I hope that's not poison ivy in photo 826. Thanks for sharing. The pot came from 'chineseteapotgallery' an ebay vendor based out of texas. He has excellent prices on his everyday type teapots and the quality is quite nice for the price. The vine in the background is a trumpet vine that is taking over my flower bed- no worry about poison ivy! I find the softer type of scotchbrite type pads are great for carefully polishing away excess tea staining- it's not anything you want to take to excess, but the gentle abrasiveness is effective without any soaps or detergents that would contaminate the pot. I have a bad habit of getting distracted by my toddler son, and forgetting about the leaves left for 'just one more round..' until the next day. A quick touch with a scrubby pad polishes away the saucer ring that forms if it's left sitting in a bit of water.